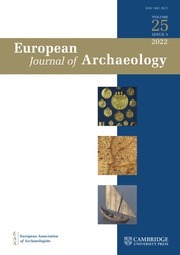 The European Journal of Archaeology is the international, peer-reviewed journal of the European Association of Archaeologists aiming to publish the best new archaeological research undertaken in and around Europe. Articles cover a wealth of topics, ranging from major reviews of the prehistoric and historic archaeology of Europe and neighbouring regions, to reports on key archaeological discoveries set within a European context, to cutting-edge research and debates on science-based archaeology, archaeological method and theory, public archaeology and the history of archaeology, to interviews reflecting upon the life and work of significant European archaeologists. All articles are published with short, accessible abstracts in English, French and German. Instructions for contributors are available here. Submissions should follow the style guidelines and total no more than 8,000 words (with bibliography).